A Native of Boston Mass. Reggie Currelley is an accomplished television and film actor. His critically acclaimed credits range from prime-time gritty crime dramas (The Shield, Cold Case, The Practice, Black Lighting), to top rated sitcoms (Scrubs, Dew Carey, Rodney, News Radio), to independent feature films, working opposite the likes of John Cleese, Michael Chicklis, Pat Morita, Jennifer Love Hewitt and Wayne Brady. 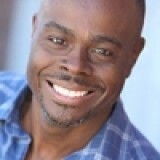 Reggie has produced short films Pieces (Boston International Film Festival, and Los Angeles High Definition Film Festival Selection), Importance, The Court, as well as Sketch Comedy shows and Theatre productions. Reggie has two other screenplays in development, and has two films shooting this year. As an actor and producer, he hopes to not only create a successful avenue for his own creative expression, but to open the door for others with unique voices and vision.